DO I KNOW WHO KILLED JONBENET RAMSEY? You never know what a day will bring. Exactly five years ago this week, I had one of those days. I knew very little about the JonBenet Ramsey murder case when I came to work that November day in 1999, but before another day had passed, I was considered - by some - an expert on the Ramseys. 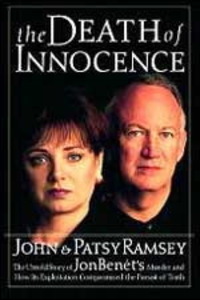 When I walked in the newsroom, I was handed a message that the publishing company Thomas-Nelson had called and requested that I interview John and Patsy Ramsey the next day. What did I know of the Ramseys? I knew many people believed one, or both, had killed their young daughter. I knew they had not spoken with the news media in well over a year. I knew that people like Tom Brokaw, Barbara Walters, Katie Couric, Diane Sawyer, Jane Pauley, Ted Kopple, and even Oprah had been trying to get the Ramseys to sit down for an interview, to no avail. I knew this was a plum interview falling into my lap. Why me? To this day, I'm not sure..... but I figure they wanted a gentle interview from someone with no agenda. The local publishers knew my interviewing style. They wanted to generate talk about the Ramseys' soon-to-be-published book, without stirring up a shouting match. I stayed up all night reading up on the case. The next day, I showed up at the publishing firm with my video crew. We set up lights and cameras, and waited. I was given a few ground rules. They would not talk about the murder - at all. That was disappointing. And I had only 12 or 15 minutes with them. Agreed. When the Ramseys walked into the room, my first thought was how pleasant and ordinary they looked. And they were pleasant. We talked for 25 minutes. It was interesting, but there were no new revelations. And that, I figured, was the end of that. But then the calls started. Local TV stations from all over. Newspapers... MSNBC... Dateline... Leeza Gibbons... Geraldo Rivera... Entertainment Tonight... NBC Nightly News... Larry King, and others. In all my years in broadcasting, I'd never been so sought after. I agreed to just a few of the requests. I was interviewed twice on MSNBC. Dateline NBC sent a correspondent to interview me. We sent a segment of the interview to NBC Nightly News. And I did a full hour on Larry King Live on CNN. It was all exciting and, truthfully, a bit uncomfortable. I knew I was not an expert on the case. But I had done something no one else could manage to do. I had talked with the elusive Ramseys. There were two people appearing with me on Larry King Live who had followed the case from the very beginning. Yet, for his final question of the show, Larry chose to ask me, "Dan, do you think this case will ever be solved?" So many people saw these interviews. I heard from old friends all around the country. Some of them I've continued to stay in touch with. As for whether I think John and Patsy did it, I'll tell you the same thing I said back then. I had always assumed they did it. But after meeting them, I began to doubt that. During my research, I discovered two facts that cast doubt on their guilt. First, the roll of duct tape used to wrap JonBenet's body was never found. It wasn't in the house the next day. Second, I learned a side door of the house had been left unlocked. That could explain how someone got in. And third, when you look into the eyes of parents, and they seem so normal, it's beyond my comprehension how they could commit such a ghastly crime and manage to go on living with themselves. So there..... if I had to place my money, I'd say 'no', they didn't do it. But I don't know. 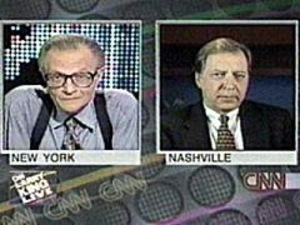 Oh, and when Larry King asked if I thought the case would ever be solved, I said, "No, I don't".